When I opened up my site earlier this week, I was surprised to find over 300 replies on one post. "Wow", I thought to myself, "I am now a powerful force in the blog-o-sphere." Turns out, some stupid spambots kept selling dipophedrin and tranzambol and eptexerdoze on my site every 5 minutes. I tried changing the URL used to post comments but the bots were far too smart for that feeble attempt at a fix, and they were posting comments again 10 minutes after I put up the new build. So I decided it was time to add CAPTCHA (Completely Automated Public Turing test to tell Computers and Humans Apart) validation. CAPTCHA provides a way to block bots from interacting with your site by providing something that's hard for them to read, but easy for people to read. I wanted to try something simple that I could write myself to see how it works. Read on to see how I implemented simple CAPTCHA in my Java web app. Site update: free MP3s and new album! I just deployed a new update to Brasee.com, and it includes a couple of big changes. First off, all of my songs are now available as free MP3 downloads! I figured that since the best things on the internet are free, these songs should also be free. You get free songs, my site meets best-things-on-the-internet eligibility requirements, everyone wins! Plus, PayPal never let me set up a micropayment account (despite me calling them multiple times), so they charge a 30-cent fee for a 50-cent song, LOL. So you can now download the MP3s directly from the album pages. I had to cut the bitrate down slightly to make bandwidth more manageable, but they still sound pretty good IMHO. I still have the CDs for sale too, so if you'd prefer to listen to the songs in pristine quality, that's the way to go. I've also started working on a new ragtime album entitled 'Dusty Keys'. Ragtime is so amazingly fun to play, especially Scott Joplin's pieces, so I thought it would be fun to put together the songs I have played over the years. I have also written a couple of rags, so when I get a chance I'll record those too. When I finished the blog features on this site, the next big thing on my list was developing a way to index and search the contents. I didn't want to let Google do it for me, because that's like cheating. I had heard good things about Lucene (actually great things, I know a guy who uses it for everything from searching for products in a web store to indexing biological information), so I started looking into that. Woot.com has been running a woot-off for the last couple of days, selling tons and tons of random stuff. 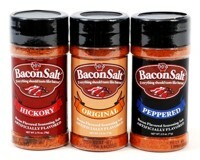 I didn't check on it until tonight, when I noticed to my great shock and amazement that I had arrived just in time for Bacon Salt®!!! I had no choice but to order all three flavors, Original, Hickory, and Peppered. I've always wanted to try the stuff — it does make everything taste like bacon, after all — but I don't think there's a store that sells it within 50 miles of my house. But Woot.com came through in a big way, and I'm already tasting the bacon. I should probably find a way to use this for every meal I eat. I was looking through my directory on my hard drive today and reminiscing (yeah, I have files that are 15 years old, I think that counts as reminiscing). In the "ancient" directory I found two awesome old games that I had forgotten all about: Rodent's Revenge and SkiFree. Rodent's Revenge is a great little strategy game where you're a mouse that has to corner cats using blocks so that they don't catch and eat you. Somehow, cornering a cat means that it evaporates, but I'm not exactly sure how or why that happens. You can download Rodent's Revenge here. SkiFree is a twitch action game where you ski down a hill, slaloming or freestyling among trees and hills and lifts and dogs and other skiers. And eventually if you ski far enough down the hill, a yeti eats you. The slalom mode keeps track of your best times — I remember trying for hours to get better and better times on the tree slalom. You can download SkiFree here. Snyder's Honey Mustard and Onion pretzel pieces: Best. Food. Ever. 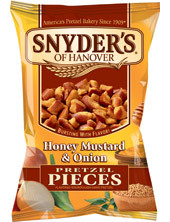 I just have to put a plug in for Snyder's of Hanover Honey Mustard and Onion pretzel pieces. They are without a doubt the best snack food on the planet. Every piece just bursts with an addictive flavor that's not too mustardy or oniony. They have totally redefined what a pretzel is capable of. I can no longer go one day without eating some of them. I'm pretty sure that the pretzels are making me post this, I wouldn't put it past them. Speaking of which, I need to go get another handful. ... is that people will call it the "Credit Crunch" for the rest of my life, and I'm going to hate the name every time I hear it. I'm pretty sure that the nickname is the worst part of the recession. Unit testing - how did I live without it? I remember a time when I didn't write unit tests. I'm not sure why I didn't. Maybe because I thought that the projects I was working on were too simple to warrant unit testing (which actually wasn't true, my thesis project would have really benefited from it). Or maybe because I thought it would take too much time when the schedule was really tight. Or maybe because I doubted the time-effectiveness of spending time writing a lot of basic tests. But no longer. A couple weeks ago I started development for an enhancement to an existing project at work. Prior to this phase, no unit tests had been written for the project, and I figured it was a good time to start. 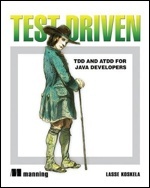 So I bought the book Test Driven: TDD and Acceptance TDD for Java Developers, read up on some of the basics of JUnit, and started writing tests alongside my components (not always test-first, but at the very latest, test-right-after). And the immediate effectiveness shocked me. I found this months ago on YouTube, and I still find myself watching it at least once a week. The song itself (Rachmaninoff Prelude Op. 23 No. 5) is fantastic, but Gilels' performance is simply perfect, with expression that blows away all the other ones I've heard. I had to go out and buy the music, but it's crazy hard – I still haven't gotten the first 30 seconds down yet. Maybe it would help if I grew an awesome combover-style hairdo like his.